The girls love Christmastime, when people adorn their homes with lights, blow-up Santas, and reindeer on the front lawn. Grandpa goes all-out every year. They can't wait to see Papa's lights. So last week they were in frenzied anticipation as we pulled up to my parent's house. 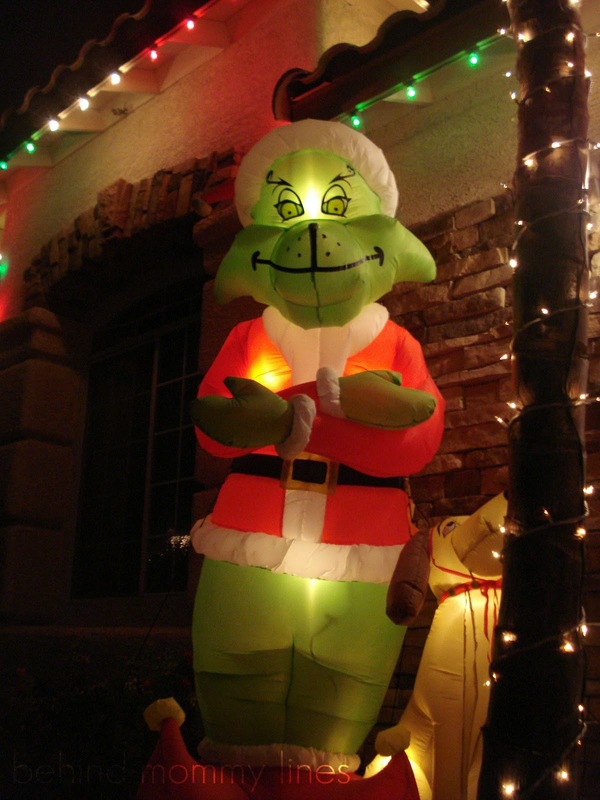 Last year there was a rather large Santa and presents prominently on the front lawn. I was kind of expecting more of the same. However, this year? 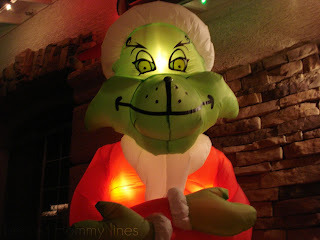 ...well, this year my Dad picked The Grinch. Upon climbing out of the car, Squirt stopped dead in her tracks and started screaming. One continuous, blood curdling scream of sheer terror. 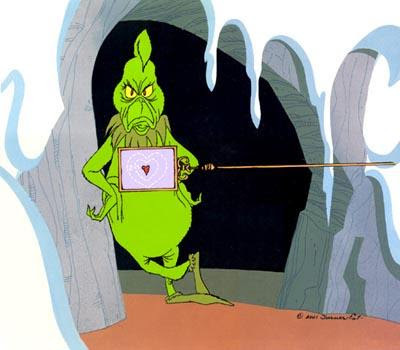 Papa, in an effort to remedy the situation, whipped out a copy of The Grinch; the old animated version. Let me tell you, if you haven't seen this little treat recently, you should watch it... and try to see it through children's eyes. That show is a terror fest. I was never scarred for life by it, but I can completely see why it had my girls running for the exits. I know he's supposed to look grumpy, but sheesh! There are parts of that show when The Grinch looks down right murdery! 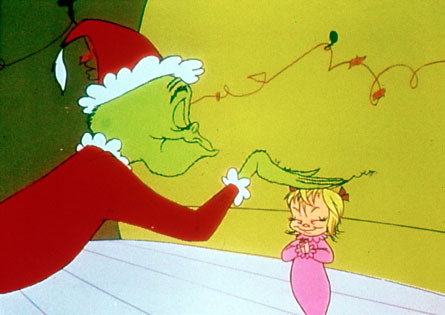 Prolly doesn't help that poor little Cindy Loo Who bears a striking resemblance to my girls. I could see the wheels churning in their heads: "Dude! 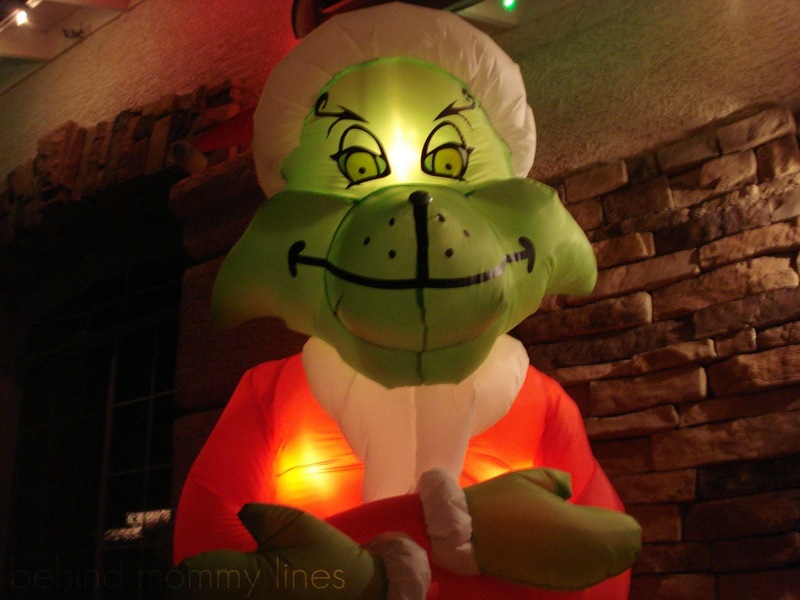 This scary green guy is gonna take all our presents! Holy crap!" The girls also found "The Grinch" too hard to pronounce. So! Due to his crazy long and scary fingers, they call him "The Scratchy." Doesn't that just make your bones shiver and your skin crawl? Papa really was trying to hype up The Scratchy, make him seem so friendly and cool! I'm sure due to the fact that seeing those little girls so scared was not his intention when decking his halls with Christmas cheer. This all ended in a very odd relationship the girls' developed with Scratchy. He is both their friend and their biggest fear. They talk about him constantly. They want to know his whereabouts at all times. They ask to go see their friend, Scratchy. And when we get there, run past him into the house. This morning over breakfast, as we were once again talking about The Scratchy, one of the girls said "It's ok, though. We're home now. We're safe." Quite honestly, The Scratchy creeps me out a little bit too. HAHA! I love your kids! They crack me up! And I agree, "The Scratchy" can definitely be a little scary to a little kid!